Starch Assay Kits | Cell Biolabs, Inc. NOTE: Each sample replicate requires 2 assays for proper data calculation. Starch is a polymeric carbohydrate consisting of multiple glucose units joined by covalent glycosidic bonds. Most green plants create starch to use as an energy reserve and it is the most common carbohydrate in the human diet. It is found in many foods, such as potatoes, corn, wheat, and rice. Starch-rich foods have a high glycemic index and increase the risk of type-2 diabetes and cardiovascular disease. Our Starch Assay Kits measure starch in food samples. First, starch is broken down into glucose monomers by amyloglucosidase. Glucose is then oxidized by glucose oxidase, producing D-gluconic acid and hydrogen peroxide. 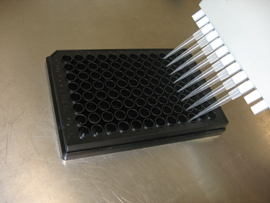 The hydrogen peroxide reacts specifically with the kit’s probe and is detected with either a standard microplate reader (colorimetric format) or a fluorescence plate reader (fluorometric format). Starch levels in unknown samples are compared to a starch standard curve.